Ann Romney looks on as Donald Trump and Republican presidential candidate, former Massachusetts Gov. 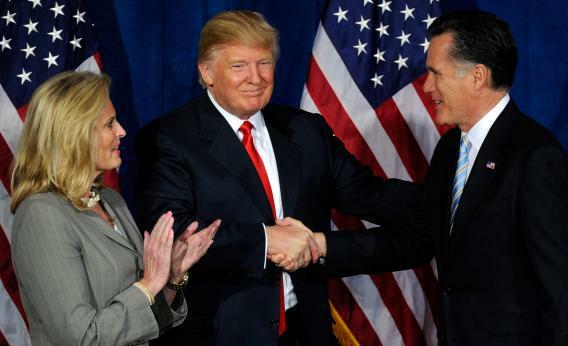 Mitt Romney shake hands during a news conference. Thanks for the generous intro, Dave, and for kindly inviting me to contribute to this space while you’re putting together what is going to be the rockingest Fresca in Slate history. Would you please ask Keith Emerson what his opinion of the keytar is for me? Considering my Truther writing, it’s only appropriate that my first post be about this morning’s Donald Trump Birther story. Trump chose the same day that he is hosting a Vegas fundraiser for Mitt Romney as the day to reiterate his Birther opinions in the strongest terms since Obama released his longform birth certificate in response to Donald’s national Birther tour last year. Trump’s latest rationale is the “Born in Kenya” story Breitbart.com broke last week. The purpose of the story, which was about a 1991 literary brochure that described Obama as having been “born in Kenya,” was not to invoke Birtherism, but to show that “Obama’s public persona has perhaps been presented differently at different times” and that the media had not vetted this fact properly. But of course, that was never what the Birther-inclined were going to get out of it. Obviously, it seems unlikely that Trump’s “own Super PAC thing” will include more Birther-friendly talk. As with the Joe Ricketts’ Jeremiah Wright blow-up two weeks ago, Romney’s team would likely do whatever necessary (short of official co-ordination) in order to signal that it wanted no part of that type of support. Romney responded yesterday to the reemergence of the Trump Birther thread with a meek statement that he doesn’t agree with all of his supporters, but he’ll take whatever help he can to get to 50.1 percent. Obama’s campaign has already pounced on this with a web video comparing John McCain’s vocal public rejection of anti-Obama racism at a town hall meeting in 2008 to Romney’s passive response to Trump’s nonsense. This same type of distraction happened two weeks ago with the nixed Jeremiah Wright ad pitch. These are not the things that Team Romney needs to be answering questions about, and every day they do is a day that David Axelrod is happy. At some point the Romney campaign is going to have to realize this and either throw Trump overboard, or completely marginalize him as a surrogate.